Use the 100% natural fibers of the loofah to exfoliate and scrub off old skin. With terrycloth backing & strap for more effective cleansing. Exfoliate, Nourish, & Moisturize. Feel Soft & Silky with the prized flower of the Chinese Emperors. Organic Loofah & Gardenia Body Bar. Cleanses, Exfoliates, Nourishes & Moisturizes with the added benefits of soy. With extraordinary natural fragrance of organic gardenia. Exfoliates, Nourishes, Moisturizes & Antiseptic cleansing. With the superior nourishing benefits of goats milk. Plus organic honey & almonds to revitalize the skin. Exfoliates and Nourishes with Antiseptic Cleansing. Contains organic tangerine , organic orange & organic loofah. Oh what an exotic dream! Great treatment for oily skin. Instantly softens, moisturizes & repairs the cuticles. Nourishes nails with natural Vitamin E , Vitamin C Ester and Olive Oil. Moisturizes with hyaluronic acid . Strengthens nails with collagen. Within seconds have better looking nails and cuticles. Feel silky smooth and refreshingly clean each time you wash with Ultra Nutrient hand & body wash. Designed to intensely moisturize, cleanse and protect the skin with natural herbs, vitamins and humectants. Plus the antibacterial action of Australian tea tree oil. Naturally Fresh 100% Natural Deodorant NEW & IMPROVED with more anti-bacterial protection. A Safe and Effective way to stay clean and fresh all day long! 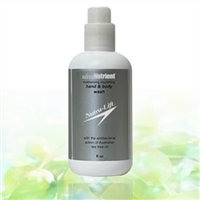 Contains no synthetic preservatives, nor any aluminum chlorohydrate or aluminum zirconium. Using a proprietary blend of herbs, essential oils & mineral salts to keep you fresh and moderately dry. Plus the anti-oxidant benefits of vitamins E & C ester, with certified organic pomegranate*, grape seed* & cranberry extracts*. With the anti-irritant benefits of aloe vera* & chamomile*. Plus the astringent & antiseptic action of Calendula*. Clear with no color and with a crisp, clean scent of the natural active ingredients. No added fragrance. Plus the anti-bacterial benefits of Silver Citrate & Australian tea tree oil that kills odor causing bacteria and eliminates body & foot odor. 24 hour protection. So why the all-natural thing when it comes to deodorant? There are numerous reasons. Primarily, the chemicals many drugstore deodorants and antiperspirants use can cause rashes on sensitive skin, something that can be intensely irritating with all the motion on hikes, in sports and just thru your daily routine. The heavy metals in antiperspirants, the main culprit being aluminum, have been controversially linked to Alzheimer's and cancer. On a more superficial level, aluminum is the reason you have crusty yellow circles on the underarms of your favorite clothes. Nutra-Lift® Naturally Fresh Deodorant is the safe, clean and effective way to stay fresh all day! Directions: Apply one spritz (or as needed) to each clean underarm or foot area. Allow to dry. Since the natural salt & sodium bicarbonate in the product may clog the sprayer if not kept clean, wash nozzle spray with hot water after each use. Nutra-Lift® Naturally Fresh Deodorant will keep you moderately dry all day. An exclusive renewing body cleanser with the maximum Anti-Aging benefits of Pomegranate and Resveratrol. Plus the legendary moisture & nourishing benefits of Certified Organic Goat Milk, collagen producing calcium & Hyaluronic acid. Including a Natural & Organic delicious blend of aromatic, anti-oxidant rich herbs to make your skin glow. Especially suited for people with sensitive skin.